I am very happy to be sharing this fantastic giveaway from my friends at Mrs. Tiggy Winkle’s. As many of you know, Tiggy’s has been a Fishbowl patron for many moons. I’m VERY excited to let you know that THIS YEAR marks their 40th (!) as an independent toy store in Ottawa. There will be a 40th Anniversary storewide sale between May 12-14. Each store is having a HUGE Birthday Party on Saturday May 13th. Drop by for giveaways, surprise visits from special guests, cupcakes, prizes, and more! If you don’t already follow Mrs. Tiggy Winkle’s on Facebook, Twitter, and Instagram you will DEFINITELY want to follow them now because there will be exclusive giveaways leading up the big day. I popped by the Westboro location last week to chat with the GM, Eira MacDonell, to see what’s new and cool in the store. First up, the Fidget Spinners. Fidget toys are a really hot item right now, they come in all shapes and sizes but little cubes seem to be more common. They’re designed to relieve stress and help people channel overflow energy. Sidebar: While I was at the store I spoke to a mom whose son bites his nails in school. She bought him this spinner to help keep his hands busy doing something less destructive. Isn’t that a great idea? 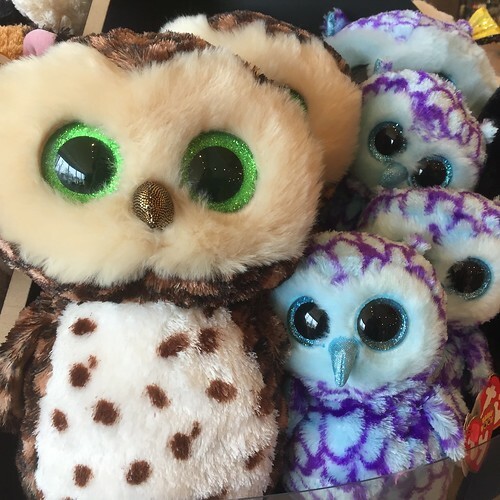 And HOO HOO do you think has some pretty cute plush in store too? I haven’t even scratched the surface of what’s in the store: games, puzzles, LEGO, Playmobil, dolls! I will say this, if you haven’t been, YOU need to see it for yourself and Mrs. Tiggy Winkle’s birthday weekend is a great time to do it. This giveaway is for one $100 gift card that will be given to one individual. It can be used during the sale or anytime afterward. In order for your entry to qualify, let me know how you would spend your winnings. I would also love to know if you have special memories of shopping at Mrs. Tiggy Winkle’s. Maybe the staff helped you find that perfect gift when you needed help? Or you found your family’s favourite board game after trying it out at the store? Tell me! One entry per email address, please! A BONUS second entry goes to folks who leave a comment on this Facebook post as well. Just make sure you come back and let me know in a second, separate, comment that you did so. If you can’t post your comment for whatever reason you can email it to andrea at quietfish dot com. Please note, I cannot be responsible if your entry is misdirected or gets stuck in my Spam folder. I will draw the winning name using Random.org at 9 a.m. EST on May 8, 2017. I’ll contact the winner via email at that time and post the name here as well. If I don’t hear back within 24 hours of emailing I will pick another name. The winner will need to pick up the gift card at a Tiggy’s location of their choice in a timely manner. 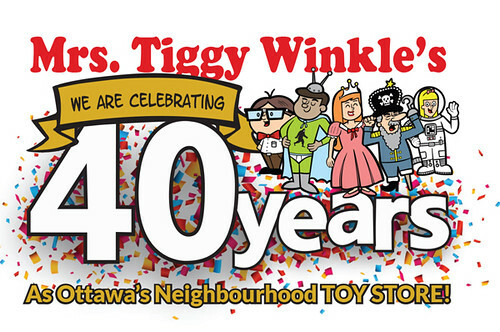 Share the post "Ottawa giveaway alert: Celebrating 40 years of play with Mrs. Tiggy Winkle’s"
152 Responses to "Ottawa giveaway alert: Celebrating 40 years of play with Mrs. Tiggy Winkle’s"
I remember buying my girlfriend a sock monkey for her newborn son. She still has it. Like Danielle, I will buy LEGO for my two 7-year-olds, it’s all they ask for! My first memory of Mrs. Tiggywinkles is as a kid growing up in Regina. My mom used to make frequent business trips to Ottawa and would often bring us back something from the store! Now that I live here, I often shop there for my kids. If I win a gift card I’ll most likely be buying lego! I commented on your Facebook post (Sarah De Diego). I would probably use the gift card to add on to the Calico critters collection I started for my little Grandaughter. ?She looooves it. The staff have helped me.over the years on MANY occasions. Holding a Melissa and Doug shopping cart for me til I could get there to helping me.find the perfect bath toy ( submarine with sprayer ) for my little Grandaughter. Helping me with gift ideas for my now 14 yr old Grandaughter. She was obsessed with Schleic characters ?And lets not.forget the adults ?Over the years they have helped me get the perfect gift for our Xmas exchange like the miniature drum desk set lol. We’ll be doing lots of traveling this summer, so I’d use the gift card to pick up lots of little things to surprise the kids with on those long flights/car trips/etc. My 9 year old and I love Mrs. Tiggywinkles. The staff are fabulous. We would spend it on lego and a star wars monopoly game. Lately, my son saves up for big lego sets and the staff let’s us know when it’s on sale. Thank you! it wouldn’t be difficult to spend $100 at Mrs Tiggy Winkles. My teen daughter would have fun spending it I know! There are so many interesting doo-dads and thing-a-ma-jigs in their store, that appeal to all ages !! I commented and shared on Facebook – thank you! Happy 40th Tiggys! My kids love crazy print socks and Schleich anything. That is what we would buy with the generous gift card! And a puzzle. A big one! Commented on your FB post of this great giveaway! I would definitely spend it on some summer fun outdoor toys and and gadgets you just can’t get anywhere else in Ottawa. That’s the great thing about Mrs. Tiggy Winkle’s! My children however might take the card & spend on Lego Friends and Our Generation doll clothes! 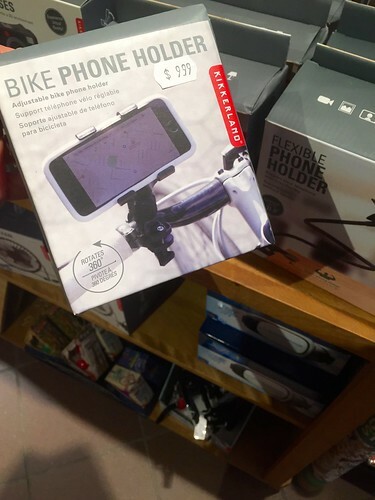 I too would purchase the phone holder for my bike. I have a really terrible sense of direction, and I’d love to plan a longer bike ride without the fear of getting very very lost! My memories: Christmastime, shopping for the annual board game that must be under the tree. Great suggestions from the always amazing staff, and running into other mom friends in the store who were also in last-minute gift buying panic! I probably visit here on my own lunch break every couple of weeks. Board games, lego and dolls and their accessories are the faves with the kids right now. We would definitely add an amazing family game to our shopping bag, plus my little boy would likely pick out another brio set (he loves the fire truck) and my daughter will want a science set and probably one of the cool tokidoki stuffed dolls she saw last time. The staff are always amazing and I remember the joy on my daughter’s face as they helped her start her calico critters collection last year. I’d ask you to give it to the 2017 Toy Mountain. I would spend it on board games! board games! board games! board games!!!!!!! I’d spend it on Exploding Kittens, Kittens in a Blender, Tsuro, Love Letter, and Bananagrams! I was sad to see the store in Place close, it was our go-to place for birthday presents! I would check out the board game section – I’ve had helpful suggestions from the staff in that part of the store previously (e.g. Labyrinth). My goodness, I am the same age as Tiggy Winkle’s? HOW AWESOME! I shopped there when I was a kid, the colourful toys on the shelves all but overwhelming me. I can remember the smell of the rubber toy animals, or the way the light would glint off the lollipops at the front of the store. To a small town girl, it was the best part of a trip to the city. Now, it is a must stop for my kids (and me!) at the Bayshore Mall. My kids love that store, and beg to go every time. It is a great Christmas shopping stop for them to buy each other gifts too. If we are drawn for the gift certificate, my goodness… my daughter would LOVE all kinds of art supplies, or Shopkins, and my son? LEGO, or maybe some of the experiment kits. They both love digging through the bins of rubber balls and other fun trinkets too! I, of course, would buy that Tetris lamp I’ve been eyeing forever, and some new journals. My husband would pore over the games. 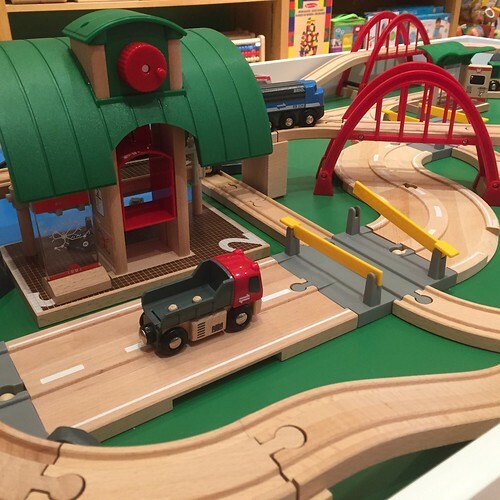 My kids loved playing with the train table while I shopped. The kids would love some new Lego sets if we were lucky enough to be selected. Every time I enter a Mrs. Tiggy Winkles I am amazed by the choices here is in the store. Last year, we went to our first tournament of Ticket to Ride during Table Top Day and we had a blast. Memories were made that day for our family of 6. I always check the board games section for sure! Hello! Thank you for this! I would use the gift certificate on board games! There’s one I want right now that is $76.00with taxes and I’d have a little bit left and probably buy some Dr. Who stuff as our whole household are fans. My favourite memory is the very first Munchkin tournament – I had so much fun and I try to go every year. It’s now a family tradition! I left a comment on your FaceBook post for a second chance – thanks again! I always buy easter toys at MTW. They last longer than chocolates! This year an employee helped me find tiny snakes to fill the plastic eggs. What a blast! I’d use the winnings to buy travel board games for our longer car rides. I really enjoy visiting “The Tig,” as my daughter calls it. If I had the means, I would get a bunch of those Schleich animal toys. They are a real hit in my family, though pricey. I wrote things on the facebook. I would bring my two grandkids and split it up between them for a shopping spree. If we won the gift card my kids would buy some new Lego and likely a few beanie boos. I have loved Tiggy’s since I was a wee thing and my mom took me every Saturday. I’m a big fan of their socks and puzzles too. There is so much that I could spend it on – Lego, Thinking putty, add on packs for Catan or Ticket to Ride. Maybe I would share with my kids too. My son would use it on a board game and some cool pencil toppers, maybe even an Invisible Ink book. Happy Anniversary! Happy birthday! I have fond memories of saving up my allowance to buy erasers at the store – I was building up my collection! And stickers! I think I would take my 5 year old in and let her choose a special toy if we won the gift certificate! We love Tiggy’s! We would expand our Thomas collection for the toddlers, and get something special and new (ie not a hand-me-down) for Baby brother. I love that a Mom created this to keep her child entertained ??? Sorry…. part II of my previous comment because it won’t let me edit: we love Mrs Tiggy Winkles and have been shopping for our boyys there since before the were born. We discovered our favourite train tracks there. Star Wars Lego and some funky socks! Left a comment on Facebook. I have stepped into this store a couple of times wanting to buy everything, but not having any kids yet. I am now expecting a baby boy in June and can’t wait to shop for legos and Thomas the train! I love Mr. Right store, especially now that I am expecting my first baby girl for next week. For the last three weeks that I have been off of work I hAve been going to the store to get different toys for my baby. I am sure she will love all of them and her nursery room looks so cute. I can’t wait to see her here and going with her to the store to buy her?? I grew up in the middle of nowhere Ontario. We had a 5&dime store in the closest town but on a rare trip to Ottawa to visit my grandmother she took us to Miss Tiggy Winkles. I was absolutely blown away because I had never experienced such a place before. As a child experiencing this place I felt as if I was in heaven. It felt like a place where all the craziness and creativity inside me made sense for the first time. I didn’t want to leave and for years would dream of the most beautiful store I had ever been in. I live within walking distance of the Richmond Rd location now and take every opportunity I have to shop there. Supporting local is important to me but I think my true reason is more selfish – I get that same feeling of belonging and excitement that I did as a kid. Thank you for the 40 years of magic you’ve provided for children and adults alike. I always know I will find the perfect gift for little ones at Mrs. Tiggy Winkles, even if I have left my shopping until the last minute. I would love to use the $100 to buy something special for my daughter- today is her 4th birthday! Great prize! Would love to get some summer toys for outside! It will be daughter’s first summer being able to play outside! I remember shopping when I was younger for Thomas the Tank Engine additions and railroad tracks back when Tiggy’s was in Bells Corners! I would definitely look to fill up my board game collection – maybe finally get Settlers of Catan. Definitely some co-op board games or maybe some Star Wars or Harry Potter memorabilia! That’d probably be the way I’d go. My kids love legos, I love games, and my husband loves puzzles so chances are I’d split it between the three and maybe some fun socks too! I have 2 girls…they would happily spend a $100! Shopkins, craft kits, Beanie Boo’s, Lego, or a cute new outfit for their 18″ dolls…there are so many options. Happy Anniversary! My family would celebrate getting Settlers of Catan, 2 bike phone holders and dinosaurs toys! We love the service and the classic toys remind me childhood. We would love to win this! My boys love the science kits at Mrs. Tiggy Winkles (and so do I)! We are also in need of a new family game!! My little one has been spending a lot of time at CHEO lately and a trip to Tiggy Winkles after to play with the trains seems to get us through the long waits and sometimes challenging appointments!! Thanks!! I have shopped at MTW since I first moved to Ottawa nearly 30 years ago ! first I shopped for my nephews and then for my own children. Now I shop for my nephew’s daugther and with a second birthday coming up I would buy her some PlayMobil. It’s my favourite ! For my years, I would bring my son and daughter to MTW to buy PlayMobil advent calendars – santa, reindeer, a manger, wisemen, camels, trees, presents … We still have them and set them up during the holidays. Happy Anniversary ! Long may you reign ! Tiggy’s had the BEST board games. Their knowledgeable staff are great at recommending games – we most recently purchased Outfoxed and we love it! We further expand our boardgame collection if we are the lucky winners!! As an adult, I always enjoyed going in Miss Tiggywinkles to browse their board games and other adulty type stuff. Now with a newborn, I will have more reasons to go in. Hello, I would let my little girl choose anything she wanted in the store if we won. We love going there to look at all the cool toys. I remember the first time I went into a Tiggy Winkles and saw all the old classic tin lunch boxes. From then on, I knew it was the coolest toy store. Commented on the facebook post as well! Thank you! Happy Anniversary ? such a great store!! My son (3.5yrs old and 14 month old daughter) love the trains in your store and would likely pick out a new train to bring home. We bought our Plasma car from you for my son but need to come back to get one for our littlest! Happy Anniversary!! I would be using the winnings to buy more outdoor amd sand toys for my daycare kiddos! I would buy something train related for my son and the same thing to send to my best friend’s son in Hamilton. 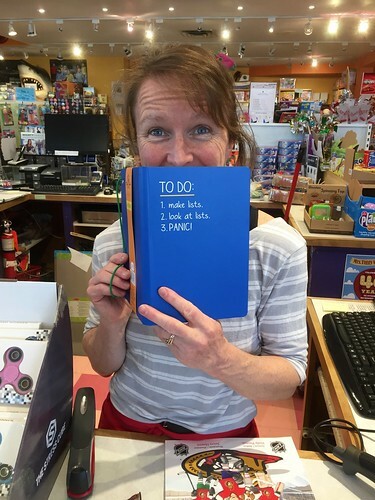 Tiggywinkles is our go-to store for birthday gifts! It’s just he right size so as not to overwhelm this non-shopping loving mama :). And the staff are very helpful. We went looking for cooperative board games one day and the staff recommended Out Foxed, which has been a big hit! I think board/card games is where we’d spend the winnings if we were so lucky – we’re a big board game family! Commented on the FB post as well (Rebecca Simpson). Thanks! Amazing. Tiggy’s is a store I grew up going to, and now love to see what’s new there with my girls. Congrats to them on 40 amazing years! So lovely to be sharing a 40th birthday year with Tiggy’s! We love the selection of board games so we would use the gift certificate to add to our collection. Special shout-out to the Lego minifigure trading post that has saved us many, many tears over the years. FB comment left as well. Congratulations on 40 wonderful years! 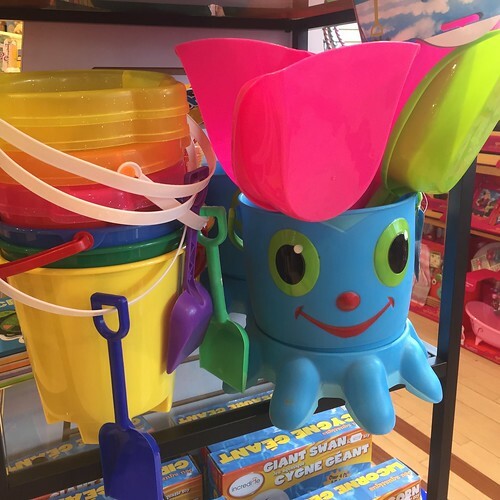 One of my favorite shopping destinations when I just don’t know what to get someone… My daughter loves it and the staff are super helpful and friendly! Happy BDay! Love Miss Tiggy’s! It’s awesome that we have a neighbourhood place to shop at! Also, I would spend the winnings on some new art supplies, dinosaur stuff for my little guy and stuffies for my little miss! Mrs. Tiggywinkles is where my husband and I bought one of our first board games which really triggered an obsession that has now resulted in a collection of over 80 games! We would spend the winnings on games for our nearly 2 yr old. She loves First Orchard but for our sanity it would be nice to have others in the rotation! Ha! Wow! 40 years! Congratulations!!! My boys love going to Tiggy’s to shop for Lego and it’s my go-to for birthday presents ? Hi Andrea, I would spend my $100 gift card for my daughters upcoming third birthday in July. My last visit in to miss Tiggy Winkles – was to purchase a specific Sandra Boynton book. Lucky for me they had it!! It was a gift for my close friend at her baby shower. Thanks again, happy 40th Miss Tiggy Winkles. Mrs.Tiggy Winkle’s is the best!!! We love your store! Happy 40yrs. I also left a message on the FB POST. I love the bright colours in Ms. Tiggy winkles! Walking into the store always makes me smile. If I win, I would spend the money on books and toys for my newborn! I suppose to be fair, each child would get $33 to spend…. but guessing what they would choose is impossible…. all three can spend an hour in your store and still not pick a favourite item! We generally prefer WESTBORO….. but as the boys get older they’ve discovered the 2nd floor in the Glebe….. a whole exciting new world! With $100, I don’t know where I would start shopping at Mrs Tiggy Winkles! Lego? Shopkins? Dolls? Boardgames? Stuffies? There are so many wonderful toys to choose from, it would be exhilarating to shop with a gift card!! We’d spend it on two spinners to start – lots of spinner envy in this house! And some outdoor craft activities. Happy Anniversary Tiggy Winkles! Happy Anniversary!! We are so lucky to have your store down the street from us. We would spend it on our first library and pack it with Little Golden Books (childhood favorites)! I would spend the $100 on toys for my grandson. I remember when Maida opened the very first Tiggy Winkle’s in the Glebe, and I shopped there for all four of my kids. Great memories! Love the store went there as a kid an now bring my twin boys there?? I left a comment on your Facebook page too! I am making my 9 month olds playroom as i type this..i would love to find some quality toys for us to play with. Best stocking stuffers and old school toys ever!! Love it! We’ve loved MTW for the 30 years we’ve been coming!! Such a fun store! Love it! I love the friendly staff at Miss Tiggy Winkles. I also love how they give 10% off to parents of twins. Having twins is very expensive so this is a wonderful little perk. How great! We’d look at Board games, LEGO, and one of the Moonjar piggybacks that’s been on the wish list. And I just left a Facebook message too — thanks for the contest! I would spend it on lego. I have been a customer of Miss Tiggy Winkles from before even I had kids! Now I love to bring my kids there to shop! It’s so hard to choose what we would get but probably a family board game. We have loved Ticket to Ride as well as numerous others recommended by the staff. My best memory (and there are many!) is when the staff went above and beyond to save my son from disappointment. He had saved up for weeks to buy a special Lego set only to discover it was no longer available! Luckily a staff member (Simon, I think) called around and had it delivered to the Westboro store to my son’s delight. Our family loves Miss Tiggy Winkles. There are so many unique toys and games. We have so much fun just browsing. I’d buy a new swing for my twins 10th birthday on Sunday! They have so many awesome products, but we LOVE Lego and anything Minecraft related, my twins current obsession. So, I bet they would choose a new Lego set to build together. Bayshore is our favourite location. Stopping in to play after a hair cut was always the highlight of the day for my boys. I absolutely love Tiggy Winkles. Many fond memories of going there when I was little and am now so happy to be able to take my son! MTW has been a staple in our family since nearly the very beginning. I remember going to the Byward Market shop as a kid and delighting in all the toys and games in store. My boys enjoy the same, whether it was endless hours at the Thomas table (I usually had to pry them away) or more recently ogling the new Lego. We love this neighbourdhood store and hope it stays for at least forty more years! I’d spend it on board games for my daughter and anything Simpsons related for Me! Our family is in the throes of a Pokemon obsession, so st least half if it would likely be spent on MORE POKEMON! The last half would be spent on DC Super Hero Girls Lego or posable figures! Great store with everything we need! Thanks for the chance to win! I would spend it on some fun summer stuff for my two kids. We recently moved to Ottawa and I have heard about the store, but haven’t made it in yet! This would be exciting First time. Comment left on the facebook post, thanks! I would use this towards some sensory toys for my newborn! Happy Anniversary Mrs Tiggy Winkle’s. I would love to win this $100 giftcard to spend on my special grandkids all 6 of them. Fingers Crossed. Happy Anniversary!!! My kids would have a blast! Congratulations on 40 years. Your business model gives hope to small businesses. Westboro location is our favourite and is easily the most visited store for our family! Here is to many more years of celebration! ? ? Ms. Tiggy Winkle’s is such a fantastic store and am glad to many people are celebrating its 40th anniversary. I was sad to see the Orleans location close, but hope people will continue shopping at the other locations to keep this Ottawa toy store open and thriving. I would introduce my daughter to your amazing store on her first birthday. We love shopping at Mrs. Tiggy Winkles for birthday presents. It seems like we’re there regularly! Our kids would love a combination of Legos and Beanie Boos, board games, and maybe a gag gift for their dad! Happy Anniversary! Happy 40th! I love your store! It’s always my go to for birthday presents. If I won the $100 gift card, I’d buy something special for my 3.5 and 1 year old. My 3.5 year old especially loves legos and my 1 year old loves cars. I’d also buy something that could be donated to a child in need. My kids love Mrs. Tiggy Winkles. Every time they get money from the grandparents that is where they head to spend it. It is also the best place to find Thomas stuff…Cranky and Sodar Steamworks were great purchases from there. Left a second comment on the Facebook page? Growing up, Tiggy’s was the only place to spend our pocket money on amazing toys! I have so many incredible memories of times spent in your store, both for myself and for my little brother. I am now lucky enough to share that love with my two little ones (and even my husband!) and we spend more than a normal amount of time at Tiggy’s! Perhaps my favourite moment to date would be when we took our newly obsessed Thomas the Tank Engine fan to your store. Watching his face light up, and eyes grow wide was a breathtaking moment for all three of us! It was such a rare treat to find store that sold the ‘d’ pre-fisher price Thomas products! He has nOw grown into Lego but has passed along his love for all things Thomas to his little brother. so our visits to your store have changed tone but remain filled with love. If we were blessed enough to win this gift we would love to pay it forward. We would be thrilled to allow each of our littles an opportunity to chose a treat for themselves and one for another boy or girl that we can donate. Our children are truly blessed and we are we working hard to teach them the joy of giving. Thank you, Tiggy’s, for all of the love and joy that you spread! You fill up the hearts of children and adults alike! ?? Second comment posted via Facebook ? Miss twiggy winkles helped me find the perfect gift for my son’s first birthday. With a new baby coming along I’d love to buy him a baby doll of his own or just a sweet gift from the baby if I win! We ? You Mrs. Tiggy Winkles! Congrats on the anniversary! We would definitely be purchasing some Lego or some travel toys for our summer road trip. Thanks for supporting such a great local business! Thank you for this amazing give away. We are a huge supporter of local businesses, and teach are little guys the values of shopping in a place like this vs. places like Walmart. With the money, I would get the boys to each pick a toy and then they would pick one to donate for a less fortunate family. We do this at Christmas too. Thank you! I also posted on the Facebook. Thanks! I would love to use this money for starting up a train table for my son! Happy birthday!! We spent a lot of our childhood in Ms Tiggy Winkles and now I bring my daughter! We’d spend the money on her bday which is also May 13th! We’re really into our family board game nights, so we would use the money to buy more board games, though I’m sure there might be some Lego purchased as well. I love that Mrs. Tiggy Winkles has a grandparents day for discount off your purchase. My mom often takes advantage of this great day and buys great toys for her grandkids ! POsted on Facebook as well! Thanks! I love to bring my two young daughters and have quality time playing in the store! I would donate the entire balance of that gift-card to a less fortunate child or family who are truly in need. Comments are closed to new entries. Stay tuned for the winner! Thanks for your entries everyone. I really enjoyed hearing your Tiggywinkle stories!